We don't really celebrate Valentine's Day in the Dye household. However, I do celebrate any opportunity to wear a new little black dress! 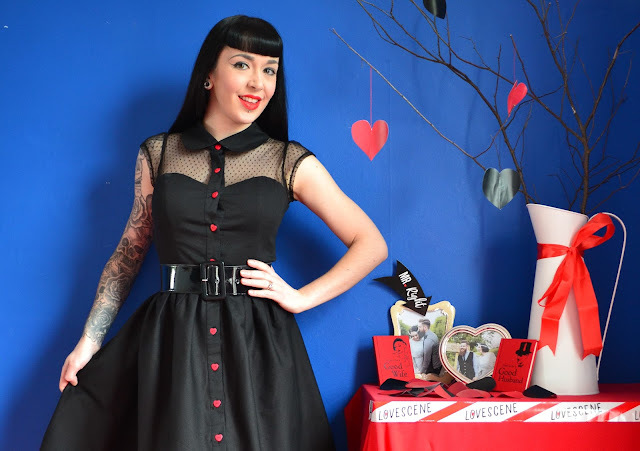 Enter the Valentine Dress from Weekend Doll! Today on the blog, I am going to tell you why it is a pinup perfect dress for Valentine's Day, whether you celebrate it or not! The Valentine Dress from Weekend Doll is right up my street. Black and red have been a 'go-to' colour combination for me for years. No matter what the dress style, if it's black and red, I am all over it like a pinup on Lucite! So when I saw this dress, I knew I had to try it! 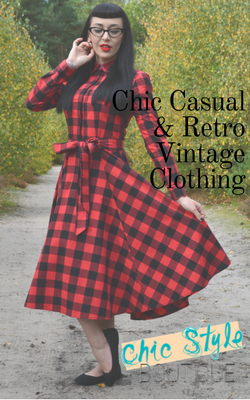 The dress features a really cute Peter Pan collar, which, along with the red heart shaped buttons and capped sleeves, gives the dress a really sweet and innocent, cutesy vibe! I think it is also only fair at this point in the post to alert you to the fact that this dress has POCKETS! Need I say more! Well, I probably should, otherwise this would be a pretty rubbish post! So, onto sizing!! As you can see from these pictures, I could do with a bit more room in the old bust region! I am wearing a UK Size 8 (XS) and the bust comes in at 32 inches, which is a bit on the small side for me, but is in keeping with a 'standard' Size 8. As the Valentine dress is a swing style, the hips are free, so the measurement here doesn't matter too much, but for reference, the hips come in at 34 inches, which is a perfect fit for me. The Valentine dress is also fully lined, which is great for slightly chilly nights, but a nightmare on ironing day! Length wise, this dress come in at just the right length for me, just below the knee. I am 5 ft 2 inches, so if you are taller, this dress may come up slightly short on you. 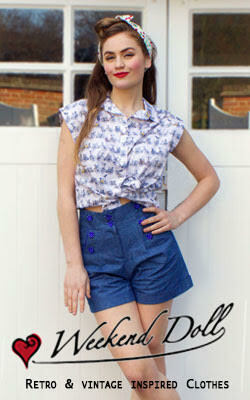 However, if you are a pint sized pinup like me, this dress will be a great length on you. The Valentine Dress is £68 and available from Weekend Doll. I teamed it with my black patent belt from Pinup Girl Clothing and my Dancing Days Glitter T-Bar shoes by Banned, available from Tigermilly.